I’ve been looking forward to sharing this siteI Do Originals with you. Check out the really cute “Here Comes the Bride” banner pictured here. What a unique way to precede the bride down the aisle. 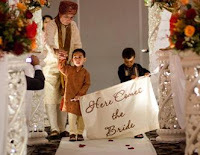 A great idea if you have multiple children who need a part in your ceremony. The parasols with “Thank You ” or “Just Married ” make such wonderful outdoor pictures,so many fun ways to use them. I Do Originals offer so many choices for personalized aisle runners that you will have a hard time choosing the right one for you. Take a look at their website to see these ideas and so many more and if you decide to order be sure to tell them you heard about their wonderful site here. We are excited to announce a new feature of our company. 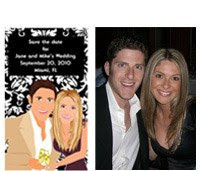 As a wedding coordinator I believe firmly in the value of hiring a coordinator for your big day. I have never had a bride tell me after her wedding that she wished she hadn’t hired a coordinator. As a matter of fact, Day of Brides usually tell me they wished they had gone for the whole package. That being said there are so many girls out there planning their own wedding because their don’t feel their budget will allow for our services or they somehow feel a coordinator will take away the uniqueness of their special day. You would schedule your appointment with me by email or phone. Its become a habit to sit and drink my coffee, catch up on emails, read those blogs that I have come to look forward to. One of those fabulous blogs is Elizabeth Anne Designs. These talented ladies have a blog so filled with inspiration and information that it is a must every morning for me. The team at Beginnings is very proud to announce that we have been added to their “Library” and find ourselves in an amazing group of vendors. Give yourself a treat and stop by and take a look. The cover article of Allure Magazine in January 2002 features the ten best makeup artists in America and we have one right here in Houston. Corinne Williams is one of those ten and in my opinion she is the best makeup artist anywhere, anytime. I love taking my brides to visit with Corinne and her Facade girls. I don’t think anyone has ever left there not feeling pampered and beautiful. Many brides have told me they are going to do their makeup themselves or they go to a makeup counter at a department store to have their makeup applied for their most glamorous day. We’ve all had our makeup done at a cosmetics counter and I always left feeling that I was a walking advertisement for their latest products. At Facade their goal is to have you leave looking and feeling beautiful whether or not you purchase one single product from them. Isn’t that whats important on your wedding day? I have often been there when entire bridal parties are in the salon and everyone is laughing and having the very best time and they leave relaxed and glamorous on their way to the ceremony. Facade is located in Uptown Park and is filled with the loveliest products and people you could ever meet. I wanted to share this site with you today. If you are looking for something special to top your cake take a look at You Top the Cake. Not every marriage consists of just a bride and groom, sometimes there are children to be added to the mix and this site can customize your topper to represent your new family. Take a peek!! Every bride searches for unique “save the date” ideas for their wedding. Some brides decide to have their “save the date” fit into the over all theme of the entire wedding and some look for that unique “set your wedding apart “card. I wanted to share with you a cute card that fits into the second category. I found this over at Beau Coup. What a fun way to share with your friends and family your engagement picture or a snapshot of the two of you. I sat down a few days ago with a bride to discuss her wedding next September. She told me she wanted a beach wedding and she wanted to use the color red. My staff and I went to work on a inspiration board for this bride. Inspiration boards are such a great way to start the wheels turning to plan your very special day. Colors, images often give birth to new ideas that create that unique one of a kind wedding for our bride. I must admit when I began collecting images for these boards I did not save where they came from in order to give credit for them. I promise to be more careful to do that from now on. Beginnings does not take credit however for any of the images,,just the inspiration to put them together.